Turns out I didn't have to wait very long today. K called me around 8:30 a.m. "I have great news!" she said. I sat down. Then she told me that HarperCollins wants to sign me for a 3-book deal on my series. She talked about some of the details that she was still working on with the contract, explained that it might be a month or so before it is all finalized, but "there are no deal breakers," she said, so it's really a done deal. She advised me to have a glass of champagne tonight. Then she asked me if I was still there. For once, I was completely speechless. "Yes," I stammered. "But you'll have to send me some of what you just said in an email, because there's no way I'm going to remember it all ten minutes from now." She laughed and said she would. Did I mention that I heart K? Since then I've been in a bit of a daze. I took my son to the park. I called my friends and family. I received about a hundred congrats in different forms on Facebook. I still couldn't quite make myself believe it was all true until, during my son's nap, I went to Barnes and Noble for a celebratory Pumpkin Spice latte. I stood in the middle of the store, breathed in the smell of coffee and new books, and promptly started to cry. At that moment it hit me that I have changed careers in the past 24 hours. Before: adjunct professor in creative writing and SAHM. Now: Novelist. From now on, I am actually going to be paid to write. Better still, I am going to be an Author. A year from now, my book will be on the shelf in that Barnes and Noble. It's no wonder I started sniffling. 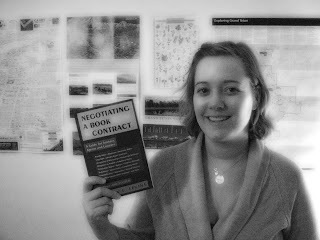 Then I bought a copy of Mark Levine's Negotiating A Book Contract and read it from cover to cover. Good stuff. I don't know a lot of the details yet, like when the book will be published or what's going to happen next. But it is, without a doubt, one of the best days of my life. Cindy, this is awesome news indeed!!! A huge congratulations!! Also, I so enjoy this blog -- your posts are so engaging and fun to read. Thanks for sharing your process -- Author! Thanks so much, Joan. It's been quite a ride, and I am so grateful that I spent a lot of that ride writing with YOU! Big hugs!